Alan Harvill, CEO of EMI Industries and President of the Association for Retail Environments, on his bimonthly column on Retail Environments Magazine. 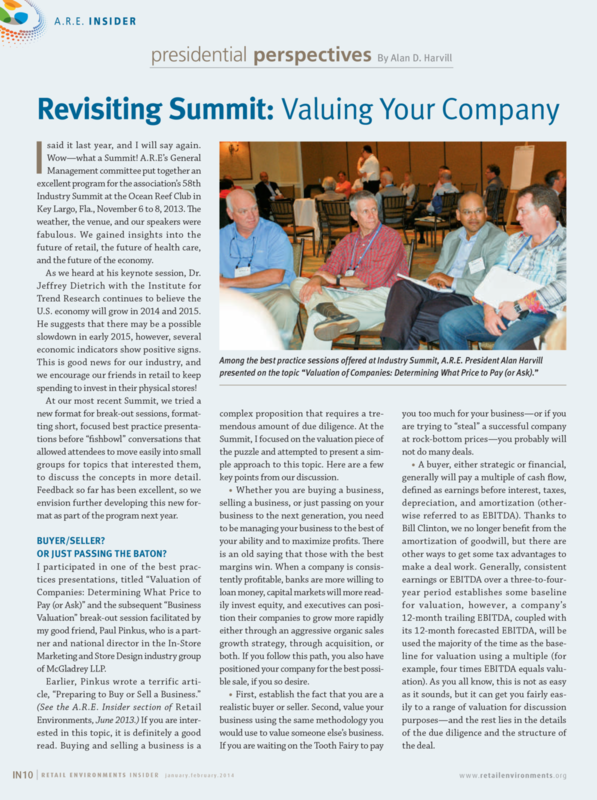 In this issue, he discusses the topic of valuing your business and maximizing profits. Whether you plan to buy, sell or pass your business on to the next generation, this is a valuable piece to read. Alan Harvill, CEO of EMI Industries and President of the Association for Retail Environments, on his bimonthly column on Retail Environments Magazine. In this issue, he discusses the challenges of growing the work force and finding the right talent for your organization. Alan Harvill, CEO of EMI Industries and President of the Association for Retail Environments, on his bimonthly column on Retail Environments Magazine. In this issue, he discusses the importance of developing contingency plans to prepare your business for the unexpected curve balls. Alan Harvill, CEO of EMI Industries and President of the Association for Retail Environments, on his bimonthly column on Retail Environments Magazine. In this issue, he discusses thinking strategically and the importance of strategic and operational plans.